Winter is Coming! Is your horse prepared? Days are becoming shorter, nights are becoming colder, leaves are blanketing the ground, and Christmas decorations are showing up in your local super market. The signs that winter is coming are here, and as we begin removing our sweaters from storage, we should also be preparing our horses for the upcoming wintry weather. Especially for elderly horses or horses that struggle maintaining their weight. Proper nutrition is the key to a healthy weight. As pastures diminish with colder weather, horse owners begin to rely on hay for the primary source of nutrition. Your horse also burns calories to stay warm. The optimal way to prepare your horse for winter is to develop a feeding program that separates the necessary calorie requirement from the horse’s daily nutrient requirement. Feeding a good grade of hay or roughage in sufficient quantity is the best source of calories, but the nutritional quality of hay is less than growing grass. The nutritional quality of the hay will also further diminish the longer the hay is stored. Beet pulp or oats may be added for additional calories if needed to maintain a healthy weight. The addition of calories will maintain body condition, but the horse’s nutritional needs can be met by supplementing your winter forage with vitamins, minerals, fatty acids and amino acids. When feeding compound feeds to meet the increased winter calorie demand, a horse owner will usually increase the amount of compound feed in the horse’s diet in an attempt to provide more calories to maintain body condition. Compound feeds are fortified with nutrients that are bound to the feed’s calories. By increasing the feeding level of compound feed to meet calorie intake, you “force feed” other nutrients, often leading to over supplementation. The best feeding program includes adequate pasture and good quality hay with the additional support of supplemental nutrients in the proper levels and ratios. With this program, oats can also be added to the diet for horses that require additional calories to maintain body condition. If your horse is insulin resistant or carbohydrate restricted, beet pulp and/or vegetable oil may also be fed. Beet pulp increases caloric density without the formation of glucose, and is therefore ideal for starch sensitive horses and underweight insulin resistant horses. A proper balanced and concentrated forage balancer will help your horse metabolize the winter forages and feed more efficiently. For example, lysine is a limiting amino acid in forages, and when supplemented to the diet the other amino acids are more effectively utilized, thereby making the diet more efficient. Senior horses will often lose body condition over the winter. Elderly horses may not have teeth that are as healthy as those of a younger horse. Missing or misshapen teeth can restrict the horse’s ability to chew. The mechanical action of chewing with the resulting build-up of saliva is extremely important for a horse’s digestion. Without the ability to chew properly, the horse will not only lack optimal nutrition, but may also produce insufficient saliva needed for proper digestion. Also, an older horse will not be able to absorb and utilize the nutrients like it was able to when it was younger. These conditions, along with the extra calories a horse must be provided in the winter to stay warm, can result in an older horse burning and using more calories and nutrients than it is consuming. This can lead the horse to become malnourished or develop other health related issues. Chopped hay, steam rolled oats, and beet pulp can all be used to fulfill your older horse’s increased calorie requirements. These feeds are optimal for horses that do not have healthy teeth. Older horses will also benefit from a pasture balancer that contains lecithin. Lecithin is an emulsifier that increases the absorption of nutrients. This will help older horses who are no longer absorbing and utilizing nutrients properly. 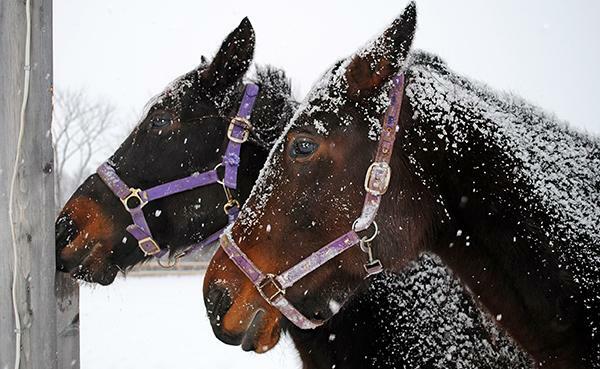 Maintaining your horse’s health and body condition can be difficult in the winter, and if not managed properly your horse’s health will be negatively impacted. Developing a proper feeding program for your horse will not only help prepare them for the winter, but will optimize their health in the coming Spring. If you have any questions, please feel free to call us at 1-800-624-1873.